Perfect to go in my newly renovated grey and white bathroom. 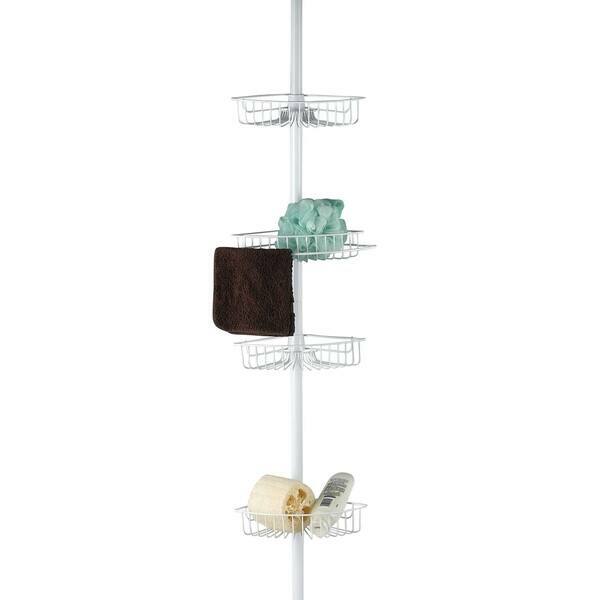 Keep all your bath items from shampoo and conditioners to soaps and washcloths organized with this versatile 4-shelf tension pole shower caddy.Easy assembly with snap and fit shelf adjustment. Four wide shelves for organizing you bath essentials. Rustproof Dura-Coat finish. Convenient washcloth holder. Tension pole design fits 5 to 9 foot ceilings. Easy to install, no tools required. This was a bit of a struggle to put together, yet it all worked out. I love how it organized everything in the shower and is very nice looking because of the color. It’s sturdy and holds all of our stuff. Oh, my God, love this Caddy, it is perfect for my shower, it saves me a lot of space, in comparison to my previous shower shelf I had. It took me 10 minutes to figure out install and put my stuff from my shelf to this caddy. I really please with this purchase. I have a small shower and it fits well in there. I have a small chair and I need to keep things at arm level. 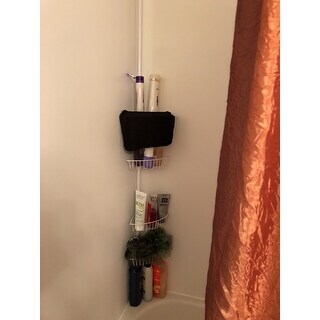 A bit difficult to assemble, but once I got the right pipes together, I was able to install it in my shower (once I found a good corner that it would stay in. The trays stay in place (a big concern was how well they would stay locked in their positions). I would recommend this item. This bathroom caddy is well built and nice. I gave it 4 stars because I had some problems when I assembled it, may have just been me but the instructions are not very clear. But, it is worth the money !! easy to install, good price looks good, hopefully, won't stain, hold heavy bottles quick delivery, instructions are missing a step .. TWO of the smaller caps are designed to hold the coil in place ...put them at both ends of the COIL/SPRING. Easily assembled and installed! Shelving storage is exactly what I need for multiple personal care items! And I love that it won't rust! Very easy to assemble. Sturdy. Really efficient for small bathrooms and apartments. Great price. The only reason why I didn't give it five stars was it is a little harder then I thought it would be to put it together. They made it to fit many showers so it is a little more complicated then I thought it would be. Great product..lasts about two to three years depending on if the water is puddling up at the base then it rusts, but other than that it's cheap and it's convenient and it stays where it's supposed to stay. Will be buying again and another two years when the one I just purchased gets old. This is cheaply made. The shelves are metal and dry thin as well. Someone can hit the side of the board and knock it right now. Very not pleased with this. No mote shower clutter. Nice looking. Needed more shelf room for my bathtub. Good reviews. 4 shelves. Inexpensive. Rust proof.